Sleek sophistication from Emporio Armani. This stainless steel timepiece features a round navy dial, stainless steel case date function and the iconic Emporio Armani eagle logo. Perfect for day to evening attire. 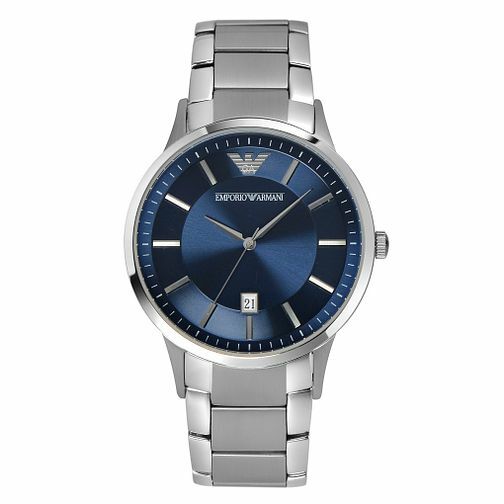 Emporio Armani Men's Stainless Steel Bracelet Watch is rated 5.0 out of 5 by 1. Rated 5 out of 5 by Anonymous from Beautifully Desgined and Stunning to look at I picked up my Armani watch just a few days back now and I have to say I am extremely impressed. The team here at Ernest Jones were extremely helpful in helping me with my purchase as this was my first time buying a watch. The strap has a very elegant shiny silver/brushed silver combination which really compliment each other and really give the watch a classy feel. But the main attraction for me was the stunning, light blue face. It goes extremely well with the silver and makes for a very elegant looking watch at such a reasonable price (in comparison to other watchmakers). I would recommend this product to absolutely anyone looking for a new watch, do not be put off by its lesser price tag, it's fantastic!